The new expansion to The Witcher 3, Blood and Wine provides a new region. In our guide, we show you how you can start the new DLC and enter into this new area. There you will go on hunting monsters again. There are three ways that you can start Witcher 3: Blood and Wine, and we will show you them below. To start the new DLC Blood and Wine you should have reached at least level 34. The difficulty of the new DLC is quite steep, so meet the requirements quickly before the release to ensure that experience with Blood and Wine is not too frustrating. Let the master blacksmith crafts you better weapons so that you can start new quests in the DLC without any difficulty. - Restart: You have to play the complete adventures of Geralt again, you simply need to create a new save file. However, you have to play Witcher 3 until the quest A Poet Under Pressure has completed. This takes about 20-25 hours of gameplay. - Load Existing Score: You maintain your choices and hang on Blood Wine just behind, then we need to ensure that you have completed the quest A Poet Under Pressure. If you already succeeded then Blood and Wine will automatically migrated into your account. - Blood and Wine start with a pre made Character: The DLC Blood and Wine gives you a pre-made character, so you can get started immediately. This is at level 34, if you have appropriate equipment and even some gold in store then you don’t worry about the distribution of skill points and mutagens. 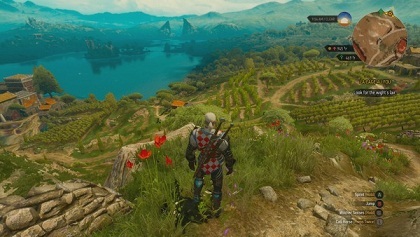 Blood and Wine: How to get to the new region? Have you met all the requirements, then the quest Envoys, Wineboys starts and under this, you may have to see the notice boards in Velen. Participate in the appropriate contract and go into the village holloway, where you have to talk to the Toussaint Knights. They will help you, and accompany you into the new region of Blood and Wine. The DLC The Witcher 3: Blood and Wine offers you 20 new quests - Enjoy!